In sources prior to the 1960s, this Pope is sometimes called Stephen III and Pope-elect Stephen is sometimes called Stephen II. See Pope-elect Stephen for a detailed explanation. Pope Stephen II (Latin: Stephanus II (or III); 714-26 April 757 a Roman aristocrat was Pope from 26 March 752 to his death in 757. He succeeded Pope Zachary following the death of Pope-elect Stephen (sometimes called Stephen II). Stephen II marks the historical delineation between the Byzantine Papacy and the Frankish Papacy. Rome was facing invasion by the Kingdom of the Lombards. Pope Stephen II traveled all the way to Paris to seek assistance against the Lombard threat from Pepin the Short. Pepin had been anointed a first time in 751 in Soissons by Boniface, archbishop of Mainz, but named his price. 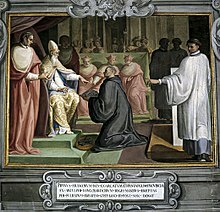 With the Frankish nobles agreeing to campaign in Lombardy, the Pope consecrated Pepin a second time in a lavish ceremony at the Basilica of St Denis in 754, bestowing upon him the additional title of Patricius Romanorum (Latin for "Patrician of the Romans") in the first recorded crowning of a civil ruler by a Pope. Pepin defeated the Lombards – taking control of northern Italy – and made a gift (called the Donation of Pepin) of the properties formerly constituting the Exarchate of Ravenna to the pope, eventually leading to the establishment of the Papal States. In 751, the Lombard king Aistulf captured the Exarchate of Ravenna, and turned his attention to the Duchy of Rome. Relations were very strained in the mid-8th century between the papacy and the Eastern Roman emperors over the support of the Isaurian Dynasty for iconoclasm. Likewise, maintaining political control over Rome became untenable as the Eastern Roman Empire itself was beset by the Abbasid Caliphate to the south and Bulgars to the northwest. Constantinople could send no troops, and Emperor Constantine V Copronymus, in answer to the repeated requests for help of the new pope, Stephen II, could only offer him the advice to act in accordance with the ancient policy of Rome, to pit some other Germanic tribe against the Lombards. Stephen turned to Pepin the Younger, the recently crowned King of the Franks (who had also recently defeated the Muslim Umayyad invasion of Gaul), and even traveled to Paris to plead for help in person against the surrounding Lombard and Muslim threats. On 6 January 754, Stephen re-consecrated Pepin as king. In return, Pepin assumed the role of ordained protector of the Church and set his sights on the Lombards, as well as addressing the threat of Islamic Al-Andalus. Pepin invaded Italy twice to settle the Lombard problem and delivered the territory between Rome and Ravenna to the papacy, but left the Lombard kings in possession of their kingdom. Prior to Stephen's alliance with Pepin, Rome had constituted the central city of the Duchy of Rome, which composed one of two districts within the Exarchate of Ravenna, along with Ravenna itself. At Quiercy the Frankish nobles finally gave their consent to a campaign in Lombardy. Catholic tradition asserts that then and there Pepin executed in writing a promise to give to the Church certain territories that were to be wrested from the Lombards, and which would be referred to later as the Papal States. Known as the Donation of Pepin, no actual document has been preserved, but later 8th century sources quote from it. Stephen anointed Pepin as King of the Franks at Saint-Denis in a memorable ceremony that was evoked in the coronation rites of French kings until the end of the ancien regime in 1789. In return, in 756, Pepin and his Frankish army forced the Lombard king to surrender his conquests, and Pepin officially conferred upon the pope the territories belonging to Ravenna, even cities such as Forlì with their hinterlands, laying the Donation of Pepin upon the tomb of Saint Peter, according to traditional later accounts. The gift included Lombard conquests in the Romagna and in the duchies of Spoleto and Benevento, and the Pentapolis in the Marche (the "five cities" of Rimini, Pesaro, Fano, Senigallia and Ancona). For the first time, the Donation made the pope a temporal ruler over a strip of territory that extended diagonally across Italy from the Tyrrhenian to the Adriatic. Over these extensive and mountainous territories the medieval popes were unable to exercise effective sovereignty, given the pressures of the times, and the new Papal States preserved the old Lombard heritage of many small counties and marquisates, each centered upon a fortified rocca. Pepin confirmed his Donation in Rome in 756, and in 774 Charlemagne confirmed the donation of his father. ^ Peter O'Brien (23 Dec 2008). European Perceptions of Islam and America from Saladin to George W. Bush. Palgrave Macmillan. p. 24. ISBN 9780230617803. ^ Pierre Riche, The Carolingians: A Family Who Forged Europe, transl. Michael Idomir Allen, (University of Pennsylvania Press, 1993), 97. Paolo Delogu: Stefano II. In: Massimo Bray (ed. ): Enciclopedia dei Papi, Istituto della Enciclopedia Italiana, Vol. 1 (Pietro, santo. Anastasio bibliotecario, antipapa), Rome, 2000, OCLC 313504669, pp. 660–665. Ekkart Sauser (1995). "Stephan II. (III.)". In Bautz, Traugott (ed.). Biographisch-Bibliographisches Kirchenlexikon (BBKL) (in German). 10. Herzberg: Bautz. cols. 1351–1354. ISBN 3-88309-062-X. Rudolf Schieffer: Stephan II in: Lexikon des Mittelalters. Vol. 8, LexMA-Verlag, Munich 1997, ISBN 3-89659-908-9, Col. 116–117. Wikimedia Commons has media related to Pope Stephen III.